The Apples of the Hesperides (left) and The Cattle of Geryion (right). If you came to this page directly, you might wish to read a page with an explanation of the title of this section and a description of Mycenae first. With great joy I announce to Your Majesty that I have discovered the tombs which the tradition proclaimed by Pausanias indicates to be the graves of Agamemnon, Cassandra, Eurymedon and their companions, all slain at a banquet by Clytemnestra and her lover Aegisthos. (Telegram sent by Heinrich Schliemann to King George I of Greece in November 1876 after having discovered Agamemnon's Mask in a group of tombs - Circle "A" - inside the walls of Mycenae). 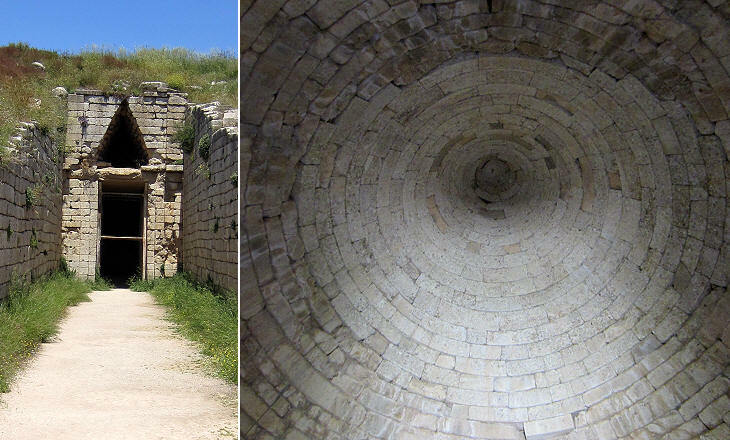 Heinrich Schliemann was a German businessman and amateur archaeologist who in 1874 associated the ruins of Hisarlik, a site on the Anatolian coast opposite Tenedos, with Homer's Troy and some jewels he found there with Helen of Sparta. In August 1876 he started excavating at Mycenae and he associated a gold mask he found there with another mythical personage i.e. Agamemnon, the king who led the Greeks in the Trojan War and whose dramatic return home was chanted by Aeschylus in The Oresteia. The authenticity of this mask has been challenged, but other masks were found in the same site and they show the high level of refinement achieved by the Mycenaean civilization (one of them is shown in the image used as background for this page). Schliemann excavated an area inside the walls of Mycenae, very near the Lion Gate; further archaeological work and more advanced dating techniques have ascertained that the graves were dug several centuries before the walls and that initially they were located outside the enclosure of Mycenae which was limited to the royal palace on the acropolis; nineteen bodies were found in six shaft graves; a circular double wall was built at a later time and it identified the site as a sacred one. 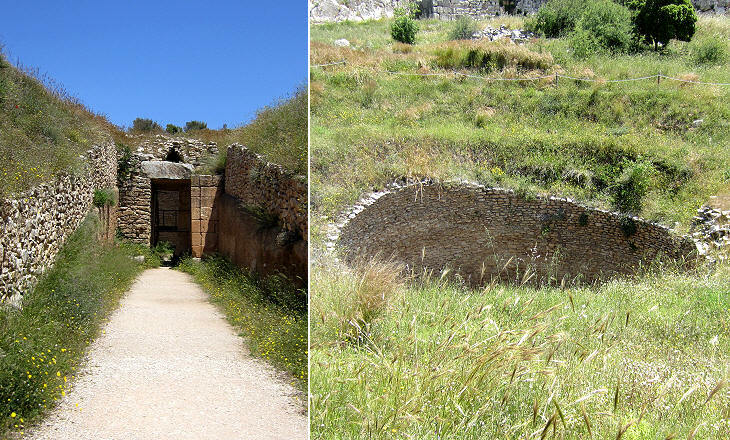 A second circle of graves ("B" Circle) was identified in 1952-55 outside the walls near the tomb of Clytaemnestra. 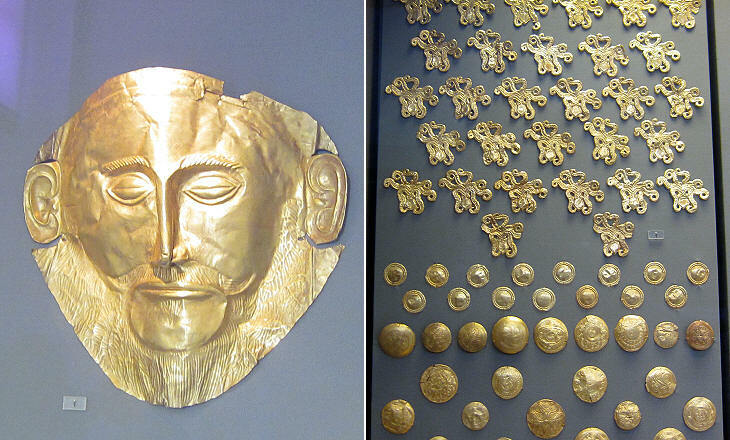 The association between the jewellery found at Mycenae and Agamemnon and his relatives made by Schliemann has been proved false, yet the diadems, brooches and necklaces of Circle "A" have influenced the design of costumes in movies, dramas and ballets based on the tragic stories of Agamemnon, Clytaemnestra, Aegisthus and Orestes and on other events of Ancient Greece (you may wish to see Diane Kruger as Helen of Sparta wearing a copy of this diadem in Troy, a 2004 movie - it opens in another window). 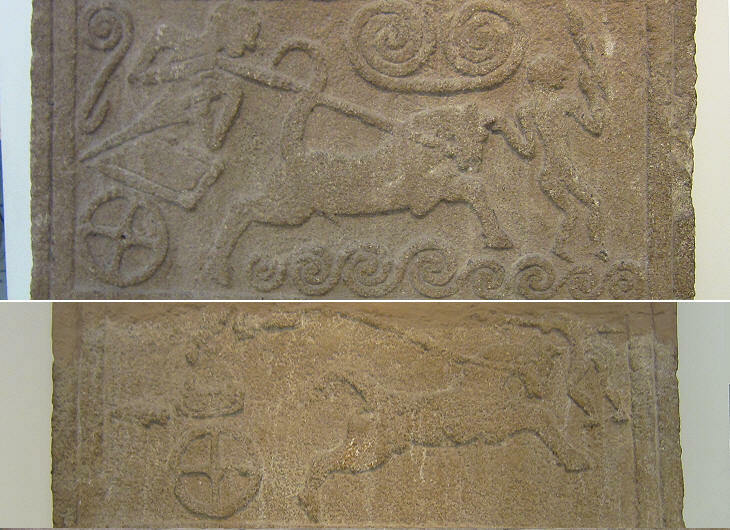 The reliefs found on several gravestones which depict scenes of hunting and fighting framed by decorative patterns are interesting for what they tell us about how horses were employed in warfare. They show that chariot warfare preceded cavalry, although one would think the contrary assuming that driving a chariot is more complex than riding a horse. Although the supposed time of the Trojan War has been set when Mycenae was already in ruins, these scenes recall Achilles on his chariot dragging the lifeless body of Hector (Iliad Bk. IX). The practice of burying the dead of the royal family in shaft graves was replaced in the XVth century BC by the use of beehive or tumulus tombs. 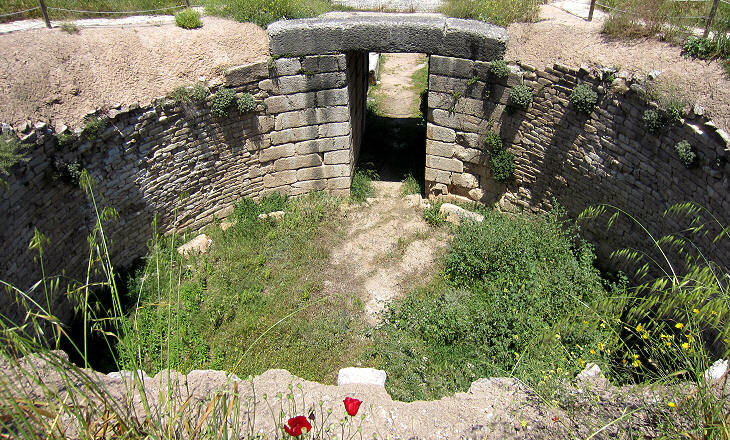 The tomb named after Aegisthus, the lover of Clytaemnestra who became king of Mycenae after Agamemnon was killed by his wife, is the oldest one of a group which is located outside the Lion Gate and along the road which linked Argos to Mycenae. Tumuli, mounds of earth and stones above a burial chamber, are perhaps the most common type of royal tomb throughout the ancient world: examples which can be seen in this website range from the tomb of King Philip II of Macedonia at Vergina to the Karakus Tumulus near Nemrut Dagi, from the Mausoleum of Emperor Hadrian in Rome to the tombs of the Chinese emperors at Xian. The most recently discovered tomb has not been named after a member of Agamemnon's family, but in the lack of a dedicatory inscription, Greek archaeologists have preferred to identify it by referring to the Lion Gate located nearby. It is dated XIVth century BC and is the first one which was closed by a door. 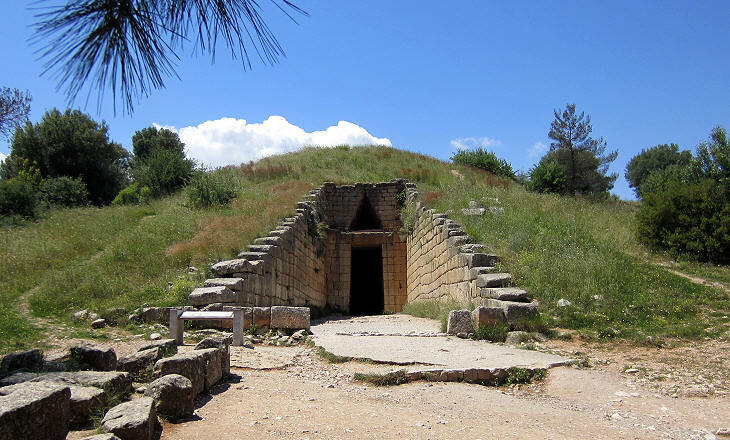 The largest and best known tumulus tomb is named after Atreus, the father of Agamemnon and Menelaus, who became king of Mycenae with the help of Zeus. His name is associated with one of the most gruesome tales in Greek mythology. Having discovered that his brother Thyestes was the lover of his wife Aerope, Atreus killed three sons Thyestes had by one of the Naiads. He then invited his brother to return from exile and at a banquet offered him morsels of his sons' flesh; once Thyestes had eaten them, Atreus ordered the bodies of the three young men to be brought to the banquet hall to show him what he had in his belly; at this point Thyestes laid a curse on the seed of Atreus which as far as Agamemnon was concerned proved effective. 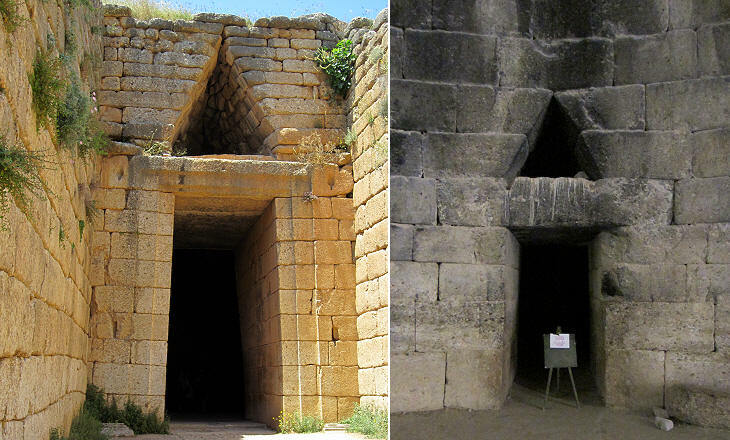 In some instances tumulus tombs were meant to hide forever the graves they housed; this was not the case at Mycenae where the entrances to the burial chambers were preceded by a long and wide corridor which in the case of the Treasury of Atreus was longer than one hundred feet. When visiting this tomb which was built after that of Atreus it is impossible not to remember that blood calls for blood. Clytaemnestra could not escape the curse Thyestes laid on the descendants of Atreus: her fate was to turn Orestes, the son she bore to Agamemnon, into a matricide. At the time Agamemnon was killed Orestes was a boy of ten; during the following seven years Orestes lived away from Mycenae among the shepherds of Arcadia. After having reached manhood Orestes went to the Oracle of Delphi to inquire whether he should revenge his father's death; he was told he should do so, but also that he would be chased by the Erynies for being a matricide (similar to other sagas of antiquity each episode announced a new development). Orestes returned to Mycenae in disguise, killed his stepfather Aegisthus and then he raised his sword on his mother; when he did so Clytaemnestra bared her breast in a desperate attempt to stop him, but Orestes beheaded her with a single stroke. 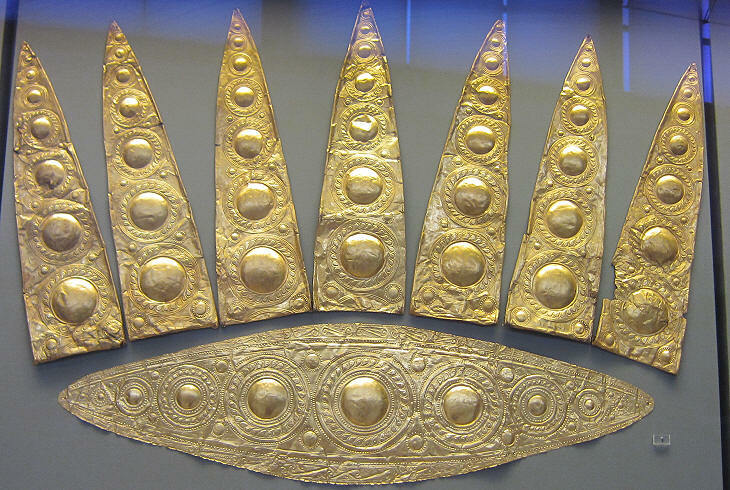 The dead were buried with attributes of their role such as ceremonial swords decorated with chiselled gold. 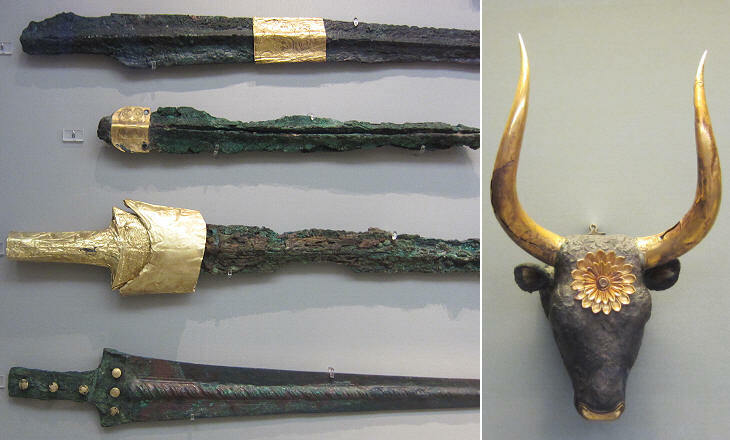 The presence of a bull's head (actually a ritual vase) among the votive offerings placed in the graves is regarded by archaeologists as evidence of contacts between Mycenae and Crete where bulls were worshipped. The Seventh Labour of Hercules (the first one outside Peloponnese) was the capture of the Cretan Bull and it is interpreted as representing the conquest of Crete by the Greeks of the mainland; this political and military development is also narrated in the myth of Theseus and the Minotaur. 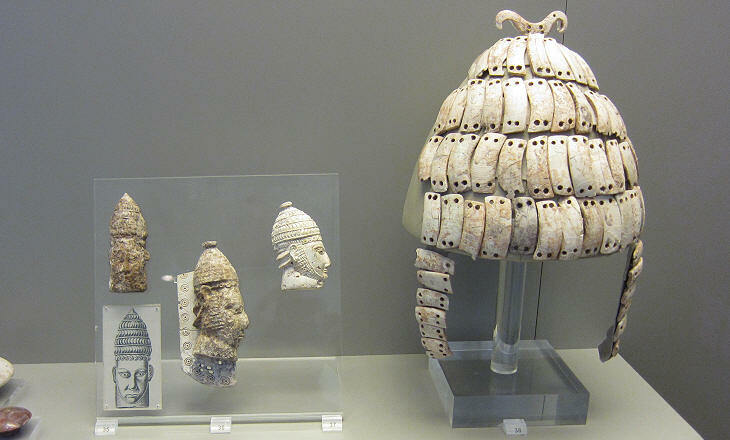 Contacts with Egypt and Crete led Mycenaean artisans to become acquainted with ivory artefacts; the new material was regarded as being superior to the other animal materials known until then (bone, boar's tusk and antler) because it had a smooth lustre, it was durable and it could be easily carved. Ivory was used instead of gold to compose unusual crowns which vaguely resemble those of the popes. Alabaster was another material imported from Egypt and regarded as being very precious; alabaster was also used for decorative friezes in the tombs and in the royal palace. 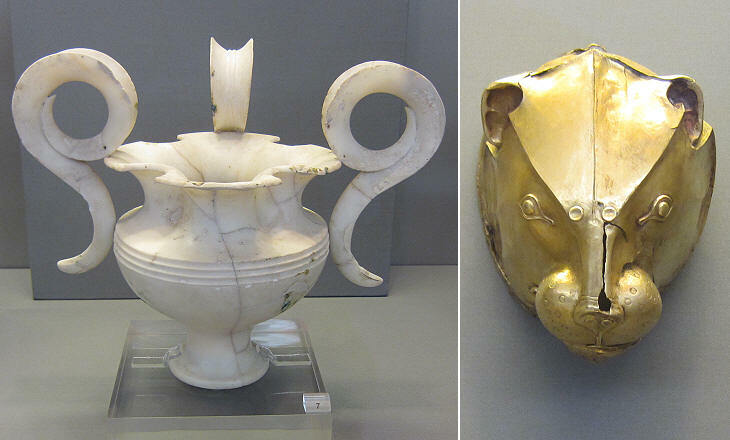 Similar to the bull's head also the lion head shown above was a ritual vase; they were thought to pass the animal's strength on to those who drank from them. 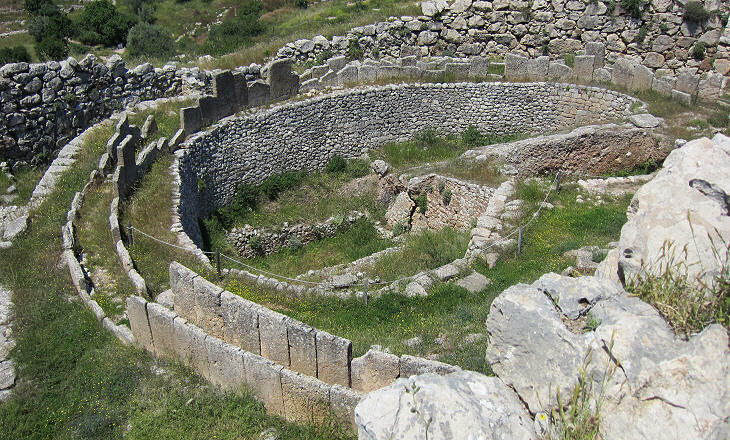 The amount of findings at Mycenae is simply extraordinary (some believe Schliemann faked some of them) and they reveal a level of refinement which is not equally evident in the ruins of the town.